PM2 is constantly assailed by more than 1800 tests. Works on Linux (stable) & macOS (stable) & Windows (stable). All Node.js versions are supported starting Node.js 4.X. Your app is now daemonized, monitored and kept alive forever. The Cluster mode is a special mode when starting a Node.js application, it starts multiple processes and load-balance HTTP/TCP/UDP queries between them. This increase overall performance (by a factor of x10 on 16 cores machines) and reliability (faster socket re-balancing in case of unhandled errors). <processes> can be 'max', -1 (all cpu minus 1) or a specified number of instances to start. Standard, Raw, JSON and formated output are available. 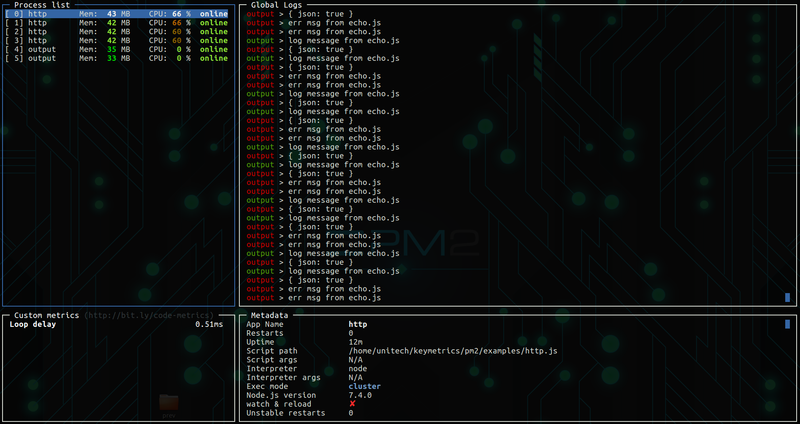 PM2 can generates and configure a Startup Script to keep PM2 and your processes alive at every server restart. PM2 is made available under the terms of the GNU Affero General Public License 3.0 (AGPL 3.0). For other licenses contact us.